Politically charged sermons can have varying effects on congregations. R. Khari Brown, associate professor in the department of sociology at Wayne State University, examines the pulpit. Khari Brown, an associate professor of sociology at Wayne State University, is a leading expert of religion and American politics. He is also an adjunct research scientist at the Institute for Social Research at the University of Michigan where he develops national surveys on race, religion, and politics. He serves on the board of the Religious Research Association and the editorial board of the Politics and Religion Journal. 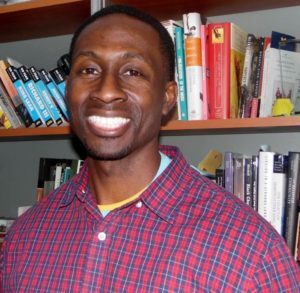 His published work examines race differences in how attending worship settings in which clergy and lay persons discuss political matters reinforces beliefs about the American government’s role in addressing; poverty, racism, immigration, criminal justice, and defense issues. This work appears in numerous academic journals and is featured on NPR’s The Academic Minute. On the steps of Central United Methodist Church was Reverend Ed Rowe, delivering a sermon about the Iraq War. He persuasively connected Jesus’s Sermon on the Mount to the Iraq War. Blessed are the peacemakers, for they shall be called the children of God. But, are we bringing peace to Iraq, he argued. This made me wonder whether Reverend Rowe’s sermon could convince listeners to see the world as he saw it, or did his sermon simply go in one ear and out the other? It turns out, sermons like this, charged with political statements, matter to public opinion, especially when considering the race of the audience. Our study indicates that when accounting for religious faith, partisanship, and social-demographic characteristics, White attendees of political congregations are more likely to adopt policy positions that promote alleviating poverty, racial equality, peace, immigrant rights, and the like. However, this relationship does not hold up as well for Blacks and Hispanics. It’s not that Blacks and Hispanics are less motivated by clergy pronouncements about social justice concerns than Whites. It’s just that White attendees of worship settings that discuss political issues are likely to hear sermons that challenge their assumptions about how their theological beliefs square with their ideas about fairness and privilege. It’s possible that these congregations attract progressive minded Whites and reinforce their commitment to policies aimed at promoting greater equality for citizens. Conversely, for Blacks and Hispanics, these sermons may not associate with their attitudes because they don’t challenge what they already believe about the government’s obligation to its citizens. And, so, it’s possible that political clergy like the Reverend Rowe’s of the world can move White Americans to think more critically about social justice.